A perfect crème anglaise! Photo by Donna Turner Ruhlman. 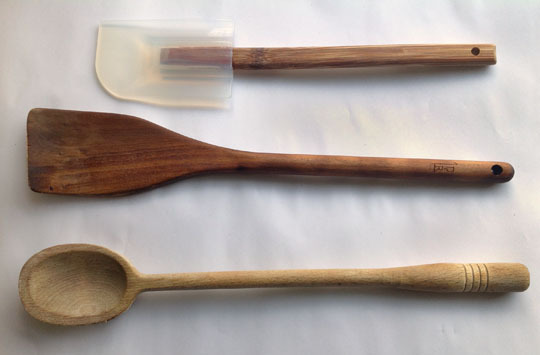 Came across this post from April 2013, on spoons, spatulas and the classic creme Anglaise. Has anything changed? I honestly don’t know.–M.R. He then phoned me to further faire caca into my cell phone until he conceded that it was the wood, not a round wood spoon, then was evasive, said a client had just arrived. But he handed the phone to his British-born, French-trained pastry chef, Laurie Moran, veteran of Per Se and Daniel in NYC and hired to fill the rather large shoes of chef Michael Laiskonis. Chef Moran’s response: everyone should use a rubber spatula. I did not disagree. He added that one needs a flat edge to fully sweep the bottom of the pot to lift the cooking egg yolk. I asked Moran about a whisk. He said, as deferential as only Brits can be, that while one would certainly whisk the sugar and yolks thoroughly, you would never whisk the pot when all the ingredients were combined as he sensed—sensed meaning a cook’s intuition based on a lifetime of cooking—that a whisk would alter the texture of the sauce, something Eric also noted. 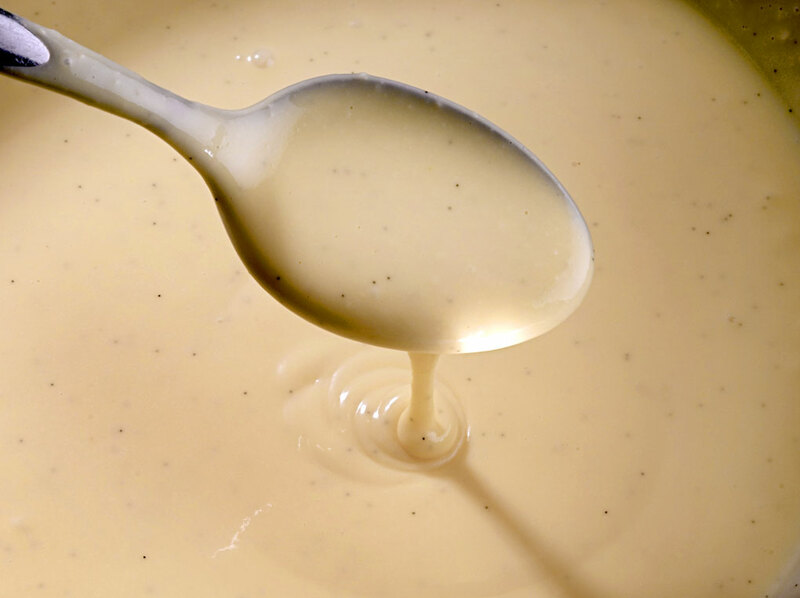 He did stress the importance of the effectiveness of the spatula at sweeping clean the bottom of the pot as the custard sauce cooked (at which point I steek out my tongue at the venerable Monsieur Allen). I hold firm that while even I feel a ’70s-ish nostalgia for the round wooden spoons that filled my childhood suburban kitchen, the round wooden spoon is an emblem of thoughtlessness of the American cook, an icon of kitchen ignorance and, in that ignorance, downright depravity, and therefore must take a militant stance on the stupid round wooden spoon, ask for a round wooden spoon intervention by Mr. Allen’s family and close friends, and suggest a burning of them in Cleveland’s public square. From top: heatproof rubber spatula, flat-edged wood spoon, American emblem of ignorance. But then—and I say this with a heavy heart, something not mentioned either in my my Stupid Kitchen Tools video nor Mr. Allen’s—a world in which someone has spent money to invent, manufacture, and advertise the Rollie Eggmaster, arguably the stupidest cooking tool ever invented, hilariously demoed by Stephen Colbert on Tuesday, well, it makes one feel fairly certain that human beings are not long for this world. The Rollie Eggmaster is the beginning of the end of our species. Until then, make a proper crème Anglaise. Here are Chef Moran’s proportions, halved, to make 500 grams rather than a kilo. Bring the milk, cream, and vanilla bean to a simmer in a saucepan, then remove the pan from the heat and let the bean steep for 10 minutes or longer. Meanwhile, set a bowl in ice and put a strainer in the bowl. Remove the bean, scrape out the seeds, and return them to the pot. Put the empty bean pod in your sugar bowl. In a bowl, whisk together the yolks and sugar thoroughly. Bring the milk and cream back to a simmer. Pour about half of it into the yolks, whisking continuously, then pour it all back into the pan with the remaining milk and cook over medium heat, stirring continuously with a rubber spatula (or flat-edged wood spoon) until the sauce thickens to nappe consistency (when you lift the spatula out, you can draw a finger through the sauce). Pour it through the strainer into the bowl set in ice, and stir with the spatula until the sauce has cooled. My past posts on Make Your Own Mayo, Derby Day Mint Julep, and Please, Consider the Egg. If you are British, nothing goes better then crème anglaise and a steamed pudding. Modernist Cuisine has a few interesting takes on desserts for the home chef. Whip up a batch of banana fritters and dunk them in the crème anglaise. agreed! You wouldn’t convert from metric and give a unit as 788/831ths of an inch, you’d just round it to 15/16 or whatever. Yeah. And if you’re converting from English to Metric, shouldn’t that be 2.54 vanilla beans? I wanted to give the chef’s exact recipe, thus the irregular measurements. My standard ratio for anglaise is 4 parts milk/cream, 1 part yolk, 1 part sugar. Simple as that. Use a scale. 🙂 I really *really* appreciate the metric units, personally. So much easier to deal with. That said, I think it is a little silly to use grams for egg yolk. It runs about 15g for a small to 20g for a large yolk, which is granted a pretty wide spread, but this is a forgiving sauce. Inspired by some of your earlier articles, I threw away several of my old round wooden spoons and added to my collection of square ones. Big mistake. I do a lot of premixing in stainless-steel bowls that are pretty much hemispherical, except for a flattened bottom. Round spoons work much better in these. Fortunately, I kept one; but sometimes I’m using several bowls for different things and I’m gonna have to go out and get another round one. for that kind of mixing i’d use a rubber spatula. but glad you have one wood spoon left! I’m sure it was written after a nice martini with 18 grams of vermouth. Gotta be friggin exact. Thank you!!! I have never been a fan of a wooden spoon, nor do I really care much for a whisk. Wooden spoons just don’t come clean enough for my liking and a whisk wastes too much of what I am making. Give me a granny fork, spoon, and a silicone spatula. As much as I like your writing, how about some new content? In May you gave us 2 rehashed articles (creme anglaise and mayo) a recipe for Mint Juleps and a review of your own book…. Been going through a rough patch. That along with severe book deadline has prevented writing for the blog. Sorry, thanks for mentioning and will try to get back to it soon. Wishing you health, happiness & creativity – where the words flow from your keyboard like the water from a springtime Multnoma falls. Kind of like Barton Fink when he stuffs pill bottle cotton in his ears. Constant clicking. I’ve gone through three flat-edge wooden spoons in the same time. I use them for literally everything. Almost. Almost literally. Actually figuratively. I use them for a lot of stuff. Because they’re awesome. Just read your book “How to roast” It is awesome. Keep the good work up. I’m not exactly sure why I find this post so charming, but I do. Perhaps it’s the cheffy kerfuffle over utensils. Wooden spoon, spatula, squared-off spoon, whisk, whatever! Why don’t we use what works for us? Heck, I use all of the above. And sometimes I start with one and switch to another. Culinary dogmatism makes me laugh. Just cook, cook delicious fresh food, and cook with love. And write. Best wishes to you and thanks for your writing. Thanks for the reminder about Anglaise. I haven’t made it for a while. We have a heat wave coinciding with cherry season here in the PNW, which reminds me of the frozen custard I made with creme Anglaise and Chelan cherries last summer. I think it’s time again. Hi, I was wondering if you would use the spatula, wooden spoon method for all ice cream bases as well. I’ve always used a whisk to make them but it stirs up a lot of air and bubbles into the base as it is cooking, thank you.